We’d love your help. Let us know what’s wrong with this preview of Style by Kate Spade. A few lucky women have been born with style -- think Diana Vreeland and Jacqueline Onassis -- but for most of us, style is something that comes with time and experience. Above all, style begins with a sense of who you are and your self-confidence. 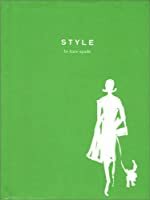 Style comes from opening yourself to the world around you -- to books and movies, art, music, travel, and especially to other p A few lucky women have been born with style -- think Diana Vreeland and Jacqueline Onassis -- but for most of us, style is something that comes with time and experience. Above all, style begins with a sense of who you are and your self-confidence. Style comes from opening yourself to the world around you -- to books and movies, art, music, travel, and especially to other people. In this upbeat and engaging book, designer Kate Spade talks about the many people and experiences that have inspired her. For Kate, movies as varied as The Swimmer and The Red Balloon have influenced her vision of style, as have such places as Mexico (where she and her husband, Andy, vacation each year), Napa Valley, and her hometown of Kansas City. In the pages of Style, you'll find a large section devoted to the colors Kate most loves and suggestions for combining them. Accessories, which are the backbone of her wardrobe, are given full treatment here, including shoes, handbags, hats, gloves, and jewelry; and a portfolio of Kate's personal favorites from her own closet is showcased. Style in the office, evening style, even ideas for style when you travel and when you play are all featured here. The last section of Style focuses on maintaining your wardrobe, including tips on organizing your closet, caring for vintage clothes, and keeping your jewelry in good condition. Boooooring. I like Kate Spade's style overall. It's very clean and and rather preppy but with quirks. All the quirkiness is sucked out when it is prescribed into rule/guidelines. The best part of the book are the quotes attributable to people other than Kate Spade! Then again, what can you expect from a book about style? I was hoping for inspiring images akin to the Kate Spade ads which are full of whimsy and good ideas for style. Instead the book is filled with not very interesting illustrations Boooooring. I like Kate Spade's style overall. It's very clean and and rather preppy but with quirks. All the quirkiness is sucked out when it is prescribed into rule/guidelines. The best part of the book are the quotes attributable to people other than Kate Spade! Then again, what can you expect from a book about style? I was hoping for inspiring images akin to the Kate Spade ads which are full of whimsy and good ideas for style. Instead the book is filled with not very interesting illustrations of random things. Your opinion of this quick-read will come from what you are expecting of it. Will it change your life? No. Will you get to look at delightful drawings accompanied by Spade's repetitive lists of her favorite things? Yes. It is a rather silly book with little actual advice, but it was fun to look at and the size charts throughout the text will provide a useful reference resource in the future. I was drawn to this book because I usually like Kate Spade’s designs. The color combinations aren’t always my thing, and I wouldn’t wear everything she makes, but she definitely has a point of view. I figured this book might help me out as I try to sort through exactly what my own style is, beyond dresses with pockets. Aren’t dresses with pockets are the best? I don’t understand why more shops don’t sell them. But back to the book. I’ve finished it and I’m still not entirely clear what Ms. Spade I was drawn to this book because I usually like Kate Spade’s designs. The color combinations aren’t always my thing, and I wouldn’t wear everything she makes, but she definitely has a point of view. I figured this book might help me out as I try to sort through exactly what my own style is, beyond dresses with pockets. Aren’t dresses with pockets are the best? I don’t understand why more shops don’t sell them. But back to the book. I’ve finished it and I’m still not entirely clear what Ms. Spade is going for with it. It’s too small to be a coffee table book, but the content is too sparse to be an actual guide to style. There are sections, sort of, but it’s mostly just a mixture of quotes from Ms. Spade and her husband Andy, some lists of things that fit whatever category she’s discussing, occasional collections of movies and books to check out, and some (admittedly lovely) illustrations. In fact, the illustrations are the best part, but there aren’t enough for this to be just a book of lovely fashion illustrations. I wouldn’t go so far as to say I wish I could get my money back; the final section on clothing and jewelry care is really quite useful, and I can see myself referring back to it on occasion. There are also handy conversion charts to refer to if you find yourself travelling a lot and needing to buy clothes overseas. But beyond that, I don’t think this book has really done much to help me sort out how I want to approach personal style. I was looking for a different book, but that’s okay. I’ll find it, and hopefully it’ll have a secret page full of all the designers who make dresses with pockets. Style is bright and appealing with its simple watercolor-like illustrations throughout, but it fails to be anything more than a coffee-table book. Flip through a few pages, and you're done; in fact, I had a hard time reading it from cover to cover. I guess it just all came down to my expectations versus what the book actually turned out to be. I was thinking it would contain more practical style tips for the average person, such as how to create multiple outfits from the same closet staples or something . Instead, I got suggestions to "[walk] through the Tuileries in geranium-and-white striped mules" and to "[pick] up [my] aunt at the airport in olive green leather pumps and a camel hair coat". I may be too much of a plebeian, but I doubt that I would ever do either of those things, regardless of how much money I aspire to acquire. This cute little book has many useful visual ideas and stylish prompts. Ideal for someone who has no sense of color or fashion. Though this book is a nice resource offering some clever ideas to those of us who have a sense of style. The sizing charts are also practical even though each designer tends to have a different perception of the dimensions of a size six figure. I enjoyed my first reading of the book and like the watercolor illustrations. Admittedly, I won't be referring to many of the p This cute little book has many useful visual ideas and stylish prompts. Ideal for someone who has no sense of color or fashion. Though this book is a nice resource offering some clever ideas to those of us who have a sense of style. The sizing charts are also practical even though each designer tends to have a different perception of the dimensions of a size six figure. I enjoyed my first reading of the book and like the watercolor illustrations. Admittedly, I won't be referring to many of the pages again since I prefer to use this guide for outfit brainstorming. Mrs. Spade does try to get the message across to "Dress by your own rules." The whole thing reminds me of a book I had as a child titled, "I Spy" with drawings of various household objects and their words. Simple, but entertaining none-the-less. The simplicity of the book jacket is appealing and Kate Spade's attempt to be the Emily Post of fashion is admirable. I love Kate Spade and have several purses and some jewelry/watches. That being said, while her book was incredibly charming, it was so incredibly unrealistic when it comes to 'style' for the average person. Maybe if I had someone to dress me every day, and a zillion dollars, I might be able to dress the way she chats about in her book. LOL I felt rather inadequate looking at my closet - I have zero possibilities to be stylish like Kate Spade. I think this book was disappointing because it wasn't what I was hoping for. It didn't seem to give any advice for the fashion-challenged - it was more like a peek into Kate's closet without a lot of explanation why what was there was there. I love her design...but this book didn't really help me understand how she thinks. The last section on caring for your clothes was the most helpful. I love the format of this book. Tiny, boldly printed watercolor drawings are sprinkled across the pages, illustrating some of Spade's references from books, movies and magazines. While some of Spade's preferences for certain styles are out of most people's league, the book and her comments are charming. Having borrowed this from my library, I will be purchasing it for my own collection. Half the time she's quoting her husband, and most of the time she's recommending dated styles and reading materials. Bring on the practical and the long-standing. State your assumptions and your time periods. And for goodness sake, stop writing factoids in tiny four-point font at the bottom of each page. This was a cute book of tips and thoughts by a hughly respected designer. I particularly like Kate Spade's use of color. The book talks about various colors and how to use them. talks abotu accessories and their importance and fun. And then there are helpful tips on caring for clothes and jewelry. And fabric guides. A light intro so to speak. Not a lot of substance but a quick light read. Charming as inspiration. Don't expect a lot of concrete advice, and there are no photographs, just drawings. I don't mind that... The idea is "Why, I'd love a pink coat!" not "I've got to have THAT pink coat." This one sits permanently on my desk. Thumbing through never fails to inspire and her fashion 'rules' are a fantastic guideline and starting point. The illustrations are fabulous and almost deceptively simple. I love these kinds of books! Lots of personal anecdotes, thoughts on the subject. Spade interjects quotes by fashion icons, as well as her husband, Andy. Illustrations are hand-drawn, making the text more intimate. The small illustrations and "color palette" off to the side really made this book interesting for me. It is always nice to hear what a style icon thinks, and I found this to be an interesting, cute read. Typical, thus no 5-stars. However, I appreciate the classic yet unique perspectives of style across multiple genres which Spade represents. Quick read, lovely illustrations, and some great personal style & entertainment recommendations. Written by someone who has more money to spend on things than I do, yet it was still fun to read her thoughts and opinions. She weaves little tid-bits about her husband throughout the book which was fun. A fun quick read - I really like the watercolor illustrations. Loved this classic! I refer back to it regularly. Fun and frothy, especially liked the segments on different colors. Short and simple, but always classy. Cute and fun; perfect for tips on garment care and fashion basics. Style can be subjective so Kate sticks with a lot of the classics. Quotes, movie and book suggestions throughout. Fast, fun read. this was a nice book and very cute. I think it would make a nice gift. A great reference book, filled with cute illustrations and quick and easy tips on how to pull off fashions, food, and social functions with flair and, well, style! Fun read, but better viewed as an inspiration piece for people who already have a developed sense of style rather than a primer for beginners. Birthday gift from my husband. Fun tips and insight into Kate's designs.